Berry picking is a big activity here. This is one of the best berry years on record. This is the first place we have lived where berry season and picking conditions are covered on the TV news. A local tip is to pick in the rain or on a windy day when the bugs are not out. They have not been too bad while I am here. Tom hasn’t seen anything worse than Wisconsin. But he won’t go in the tundra without bug dope. 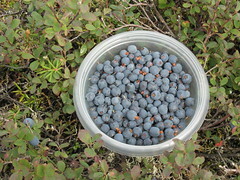 We have a couple of pints of blue berries frozen with more to come. They are huge here. Soon the black berries (crow berries) and cranberries will be ripe.